Hopefully this past week was the last week of subzero temperatures this winter in southern Minnesota. Temperatures again dropped well into the negative teens on both Monday and Tuesday nights, with daytime temperatures struggling to reach the single digits above zero until yesterday. Now, however, it appears that the tides are finally beginning to turn, as the daily high temperatures from tomorrow through next weekend are forecast to be in the 30’s and even low 40’s! On some days the lows are also predicted to stay above 32 degrees Fahrenheit, which means we should experience considerable melting throughout the week, and there’s even a chance of rain on Thursday and Friday! With such a prolonged melting period its possible that the Minnesota River might rise earlier than expected. Last spring the river crested here in south-central Minnesota around mid-March, but it wasn’t until early March that we experienced temperatures sustained above the freezing/melting point. And we’re just approaching mid-February right now, mind you. A flood in February isn’t necessarily unheard of in Minnesota, but neither is it common; such an early flood would at least be a little unexpected following the weeks of extreme cold that most of the country has felt the past couple of months. Of course ten days from now we could be dipping down into the teens and single digits again, but if temperatures do remain around and above freezing for a couple weeks in a row then we might even see “Mount Linnaeus” turn into “Lake Linnaeus” before March arrives. 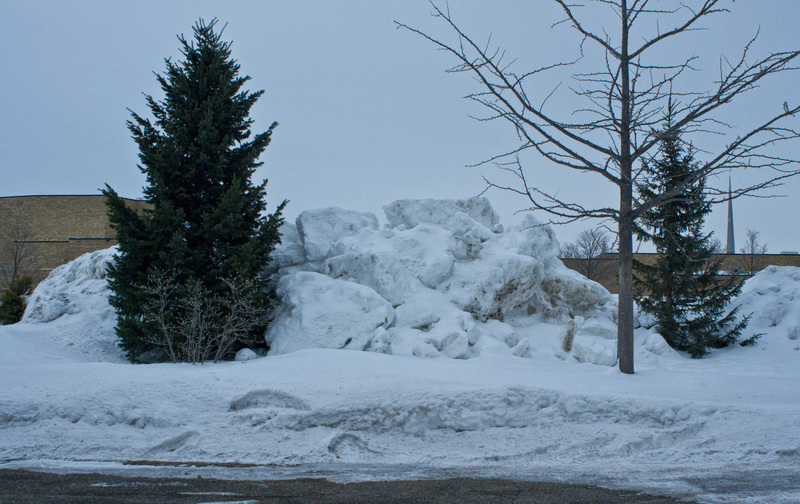 "Mount Linnaeus" between the Interpretive Center and the student parking lot to its north, 2/11/11.